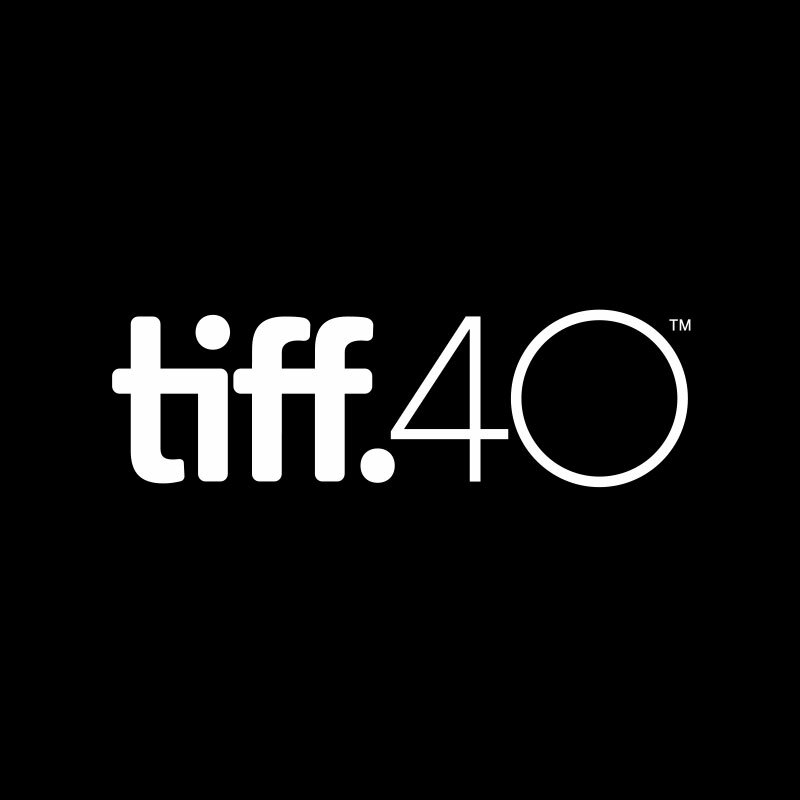 The History Through Hollywood series looks at old films as inadvertent time capsules packed with the norms and customs of a bygone era. Traditions change, cultural mores shift, and technology races on; what was once commonplace might now seem totally weird. 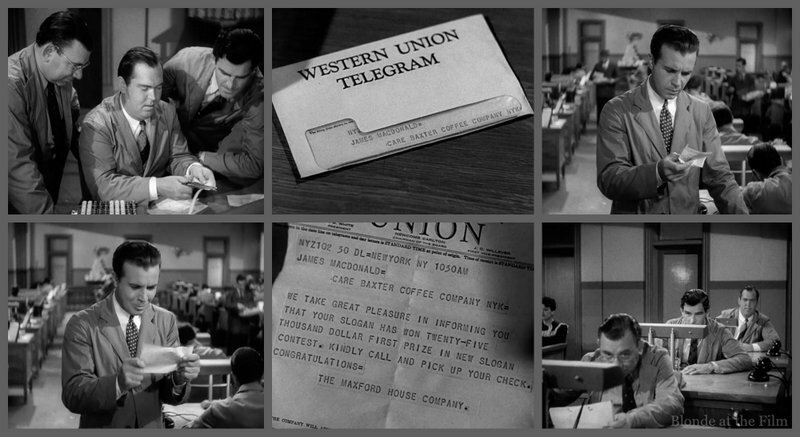 For example, have you ever received a telegram or placed a call through an operator? Why does everyone in old movies have an English accent? And have you ever noticed that married characters sleep in separate twin beds? Old movies are full of history hiding in plain sight, and you can learn a lot without meaning to, and usually without even noticing. 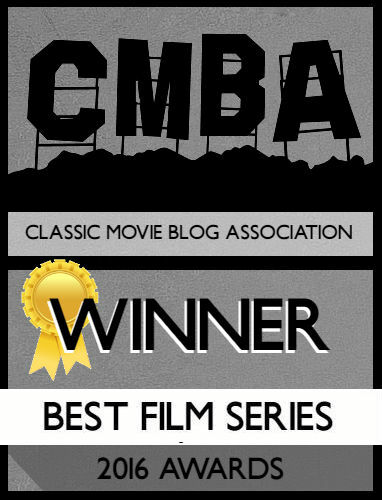 The History Through Hollywood series is also my attempt to explain why old movies can sometimes seem so very different from today’s films. With a little context, a “boring,” and “tame” old film can suddenly shimmer (watch for those cross-dissolves! ), and something that seems utterly odd can make sense (why are so many wives going to Reno?) And why is it such a big deal to shampoo your hair? You can read my other History Through Hollywood posts about fashion, doughnuts, train travel, vintage ads, drugstore lunches, and the ever-smoldering cigarettes here. This entry will examine Listerine, newspaper editions, department store fashion shows, and elevator operators. Read on to learn more! Halitosis was the #1 threat facing single men and women. Even the most beautiful, fascinating, wealthy young woman would definitely end up alone and miserable, creeping toward “that tragic thirty-mark” (!) if her breath veered into the nasty zone. It wouldn’t just keep you single, either, but could ruin a marriage! Ladies, stay vigilant and buy Listerine! These aggressive ads might make you think that bad breath was an epidemic, but the boom in anti-halitosis ads was due more to a clever marketing campaign by Listerine than an actual health issue. 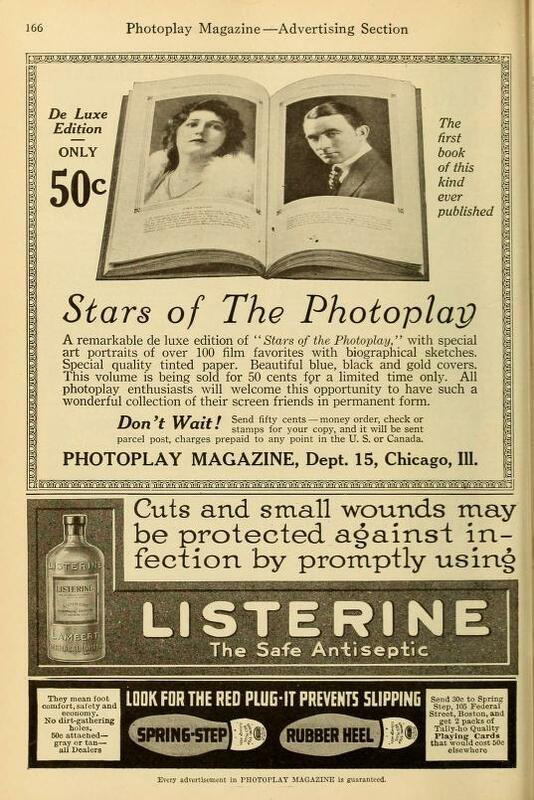 Silver Screen, October 1916 via Lantern Media History. Can you imagine how much that would sting?! 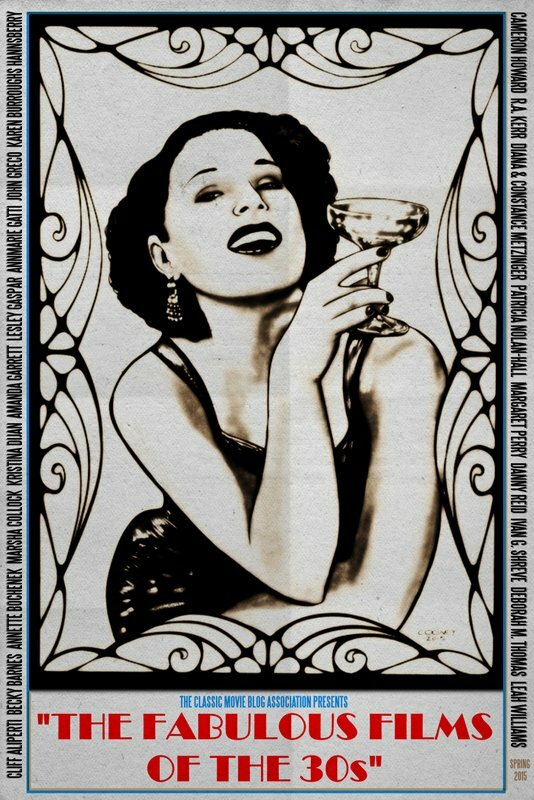 The mouthwash was first introduced in 1879 as a surgical antiseptic and general germicide. (It was also marketed as a floor cleaner.) In 1895, it jumped into dentistry, and about twenty years later it became available as an over the counter mouthwash, the first in the country. It was a fairly quiet product until the 1920s when Listerine adopted an advertising campaign featuring sad young people doomed to a life of loneliness thanks to their bad breath. Until this campaign, halitosis was not a common term, and bad breath, though not celebrated, wasn’t constantly blamed for ruined romances. But Listerine changed all that. Advertising scholar James B. Twitchell wrote, “Listerine did not make mouthwash as much as it made halitosis.” And it worked! Thanks to the ads, people started worrying about halitosis, and sales of Listerine skyrocketed. No one wanted to be the clueless spinster or friendless bachelor featured in their favorite magazines. Married couples didn’t escape censure either; reading these ads might convince you that bad breath was the leading cause of marital discord. According to Listerine, if you wanted to protect your romantic future or the happiness within your marriage, you needed their mouthwash. Plus, you could also massage Listerine into your hair to cure dandruff! Win-win! Screenland, May 1951, via Lantern Media History. Notice the guy in the background giving her the thumbs-down! You might notice that movie stars are absent from these ads. The studios weren’t silly enough to make their actresses the face of halitosis! So although stars advertise stockings, shampoo, soap, clothes, cigarettes, makeup, and almost anything else, they never hawk Listerine. Nowadays, Listerine is marketed more as a bacteria-killer for dental health than a halitosis cure for lonely singles, but it’s interesting to look back at how the common product got its start. 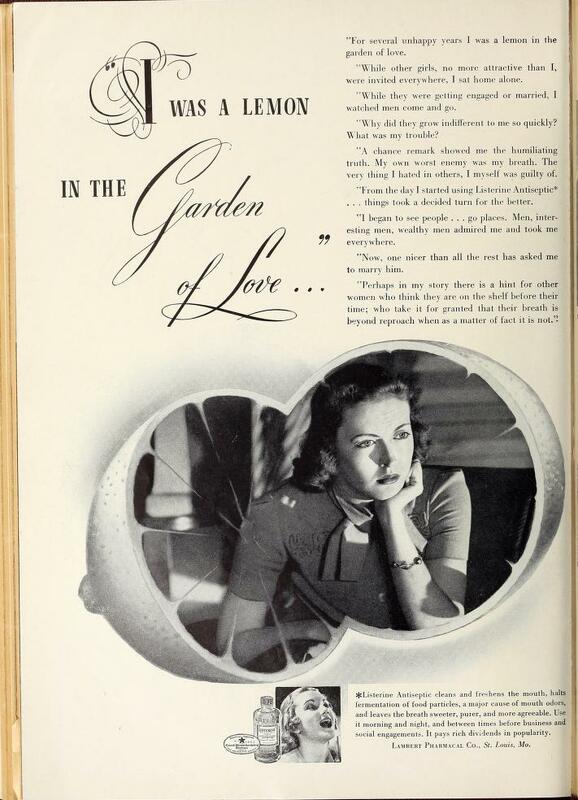 And ladies, always remember, if you’re “a lemon in the garden of love” like this sad sack, just use some Listerine and soon “men, interesting men, wealthy men” will “admire” you and “take you everywhere!” So give a swish “Before Every Date! Newspapers published multiple print editions throughout the day. 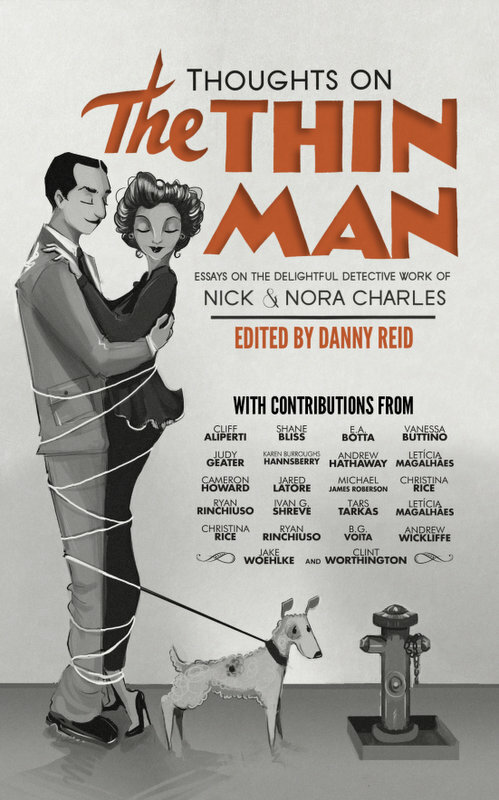 In After the Thin Man (1936), Nick and Nora stay up all night and sleep through the next day until about 6pm. They finally wake up, totally disoriented and ready for breakfast despite the late hour. They are dumbfounded when they notice that their freshly delivered newspaper is the evening edition, not the morning one. Thanks to the newspaper, the pair finally acclimate to the actual time of day. You wouldn’t find that scene in a modern movie, but a 1936 audience had no trouble following along. After all, early and evening editions of newspapers were a common part of life for over a century. In fact, George H. Douglas writes in The Golden Age of the Newspaper that two-thirds of American newspapers published an afternoon edition by 1890, and evening editions became popular soon after. This expansion was a result of two technologies: faster printing presses and the telegraph. Presses improved in the 1830s and made it easier to produce thousands of copies at a time. Printing two or three editions a day was suddenly an option. The next decade saw the development of the telegraph, which spread information much faster than ever before. With the telegraph, news flew across the country and the world in minutes, not days or weeks. The fast presses could keep up with the onslaught of information, so breaking news that happened at midday could appear in the evening edition rather than wait for the next morning’s paper. Another, surprisingly simple technology spurred the later editions in the 1890s, too: the increase of oil lamps and then gas and electric lighting in homes helped popularize evening papers. Before good lighting, there wasn’t much interest in an evening edition. A dark house lit only by candles and firelight wasn’t an especially conducive environment for nighttime reading. The telegraph, printing presses, and lighting improvements in the 19th century led to a burst of newspaper publishing. Although small towns might have a daily paper or even a weekly publication, large cities like New York, Chicago, and Philadelphia had many highly competitive papers vying for customers. Publishing “Extra” supplements, afternoon, evening or “final” editions, as well as early editions that hit stands before midnight, was a great way to sell more papers. Multiple editions were a common part of life for many Americans, so it’s not surprising that they show up in movies. But once you start looking for them, you’ll be amazed how often various editions of newspapers show up onscreen. Today, a movie might cut to CNN or even a text alert to display breaking news, but back in the Golden Age it was all about the newspapers. They frequently pop up to give characters (and the audience) information or demonstrate the urgency or importance of a situation. Multiple editions come into play by constantly updating the narrative and emphasizing how crucial or newsworthy something is. The latest plot development must be important if it leads the evening edition, or if newspaper boys shout the latest update from the “Extra” supplement! 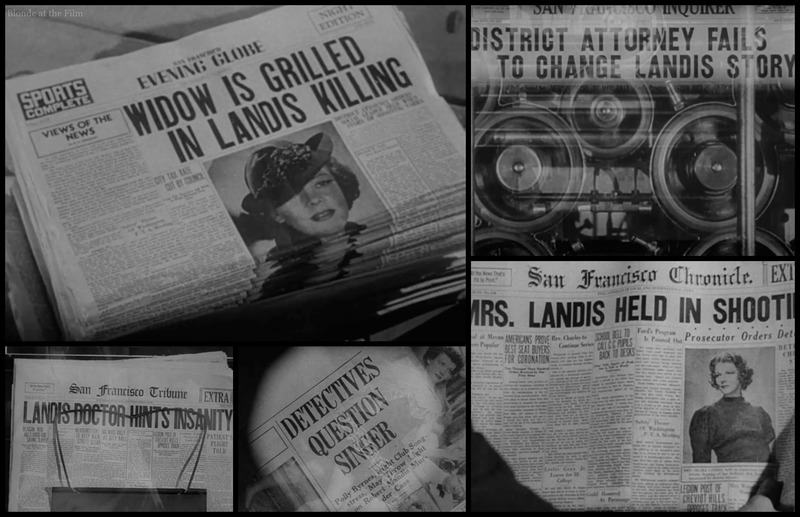 For example, The Thin Man montages rely heavily on “Extra” and special editions to emphasize the frenzy and importance of the latest murder. Fortunately, the big movie studios had their own printing shops where newspapers were manufactured on demand. 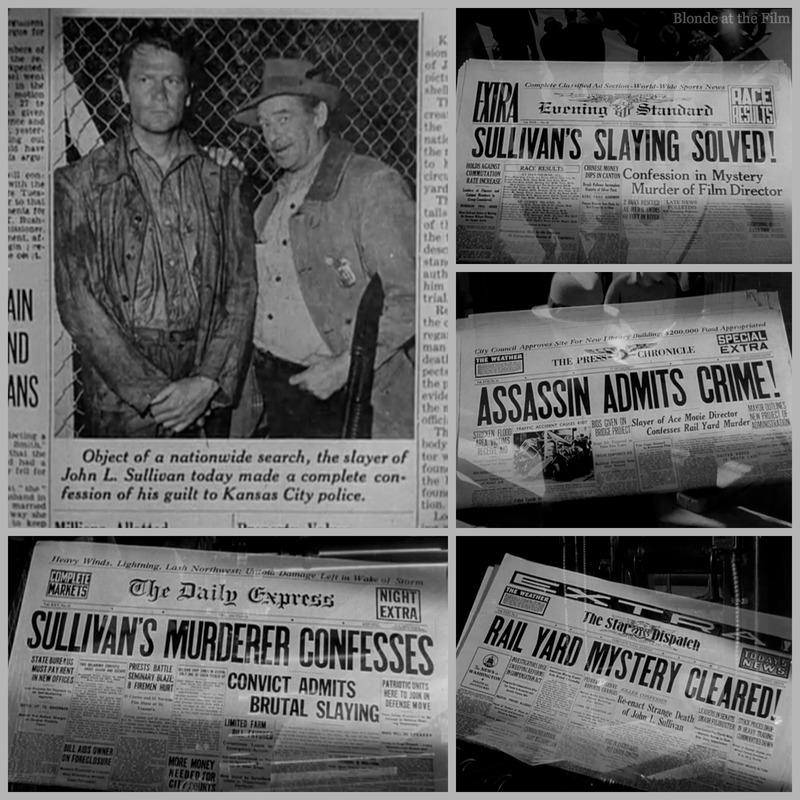 “Fake” newspapermen stayed busy printing all sorts of fictional front pages and articles! The original #FakeNews. Easy to Wed. Names of newspapers like “The Evening Globe” or “The Morning Star” reflect their origins as timed publications. The reliance on newspapers and multiple editions changed when television came along. The New York Times stopped publishing a daily early edition available at night in 1997, for example. And now that TV news and websites can update instantly, we don’t need a copy of the evening edition to get the latest scoop on a developing story. Multiple print editions are mostly a thing of the past with newspapers now updating their digital sites instead of printing different issues. 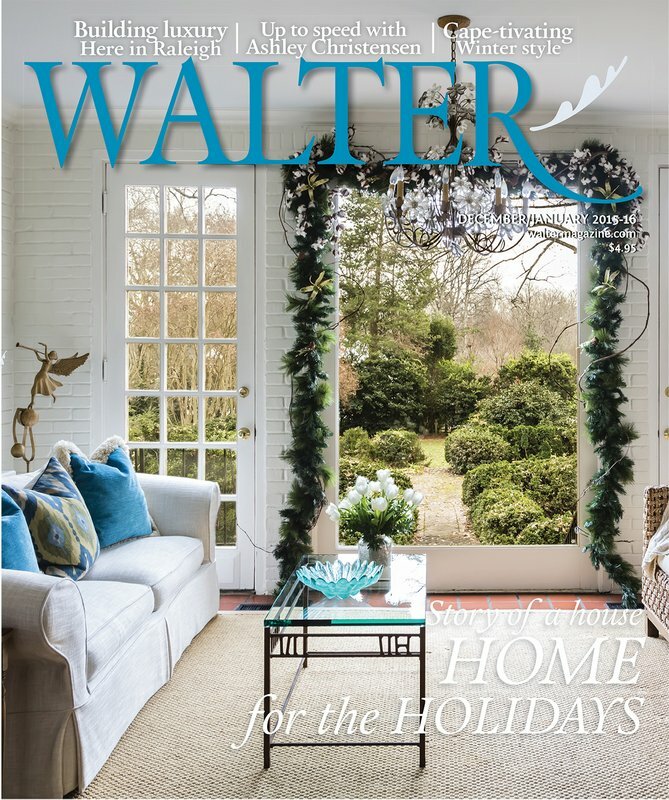 With print circulation down and unlikely to recover with TV and the Internet, the memory of multiple editions will fade, but at least they’ll be preserved on screen! 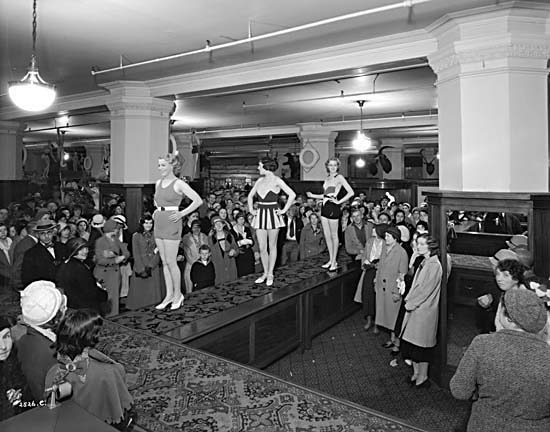 Department stores staged fashion shows for their shoppers. Unless you’re buying couture, you’ve probably never shopped for clothes off of live models. Instead, you browse the racks and take a look at mannequins when visiting a shop. 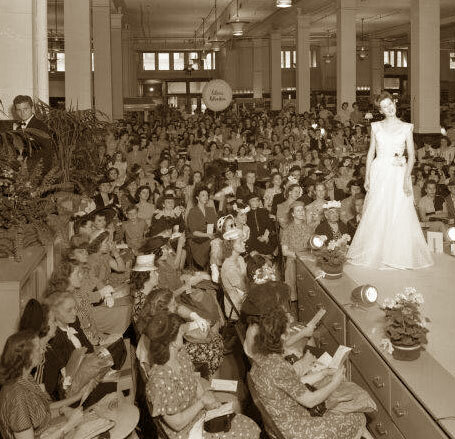 But old movies present a different shopping experience: fashion shows in your local department store! You might think it’s a Hollywood convention to add some visual interest and glamour to the shopping experience, but it was actually a fairly common practice at upscale department stores. According to the book, Fashioning Models: Image, Text, and Industry, fashion shows were a huge draw for consumers, so by the 1920s, they had become standard retail practice at the big department stores. Some of the shows were occasional special events, but others were a daily occurrence, usually taking place at lunchtime or teatime. 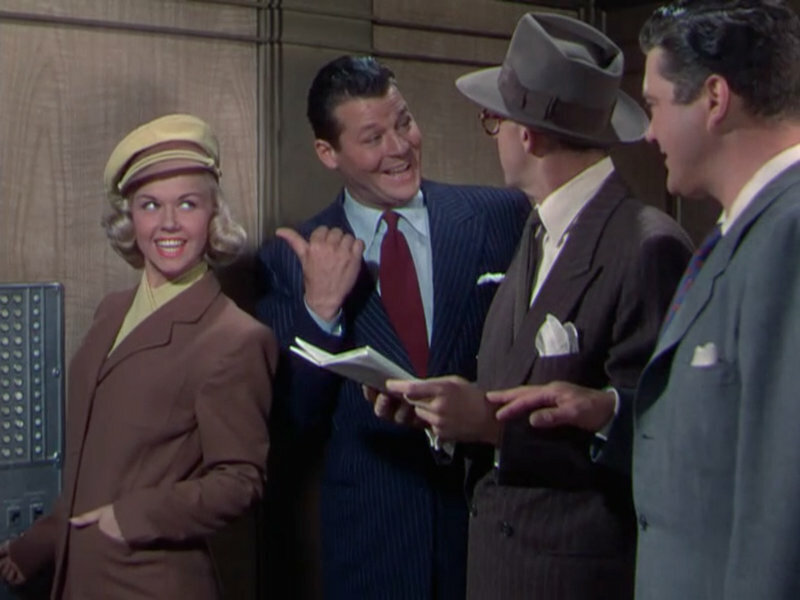 Often the shows were themed, and they usually featured narration, which you’ll see in many movies, including The Women (1939) and How to Marry a Millionaire (1953). Gimbel’s in New York, for example, staged an elaborate daily show with models strutting through an “Italian Garden” set in the store. The Gimbel’s show drew thousands of people everyday and continued for five years through twenty variations. Gilmbel’s shows and others like it were so theatrical that some historians point to vaudeville and revues like the Ziegfeld Follies as influences. Those stage presentations often featured beautiful women parading around the stage in astounding costumes. Not all the fashion shows were that elaborate, of course. But they were more common (for the average person) than they are now. So if you lived in a city in the first half of the 20th century and wanted to see some live models displaying the latest styles, you probably could find a show. Hollywood certainly did its part to make fashion shows part of the mainstream. The studios recognized the popularity of fashion shows and found ways (not always particularly rational nor narratively-motivated) to incorporate them into movies. The on-screen fashion parades fulfilled the glamour quotient, and they also helped studios show off their resident costume designers. 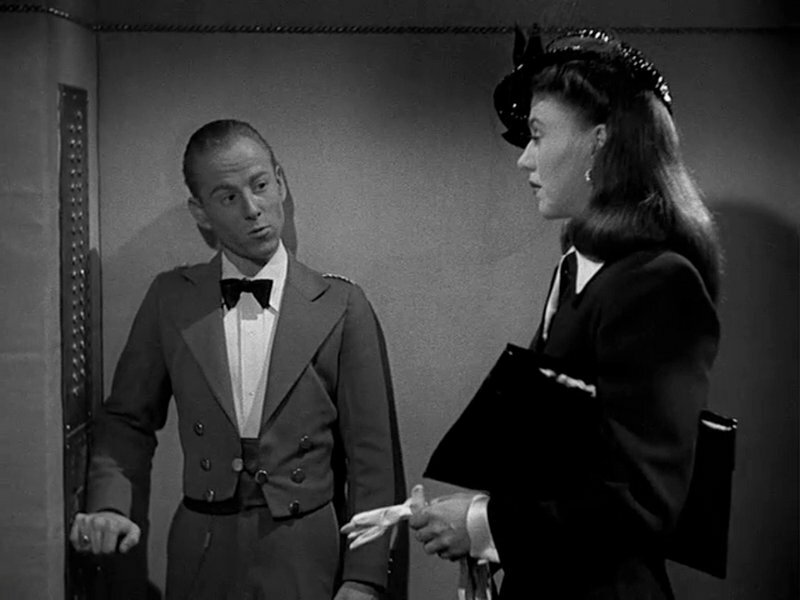 The fashion show attended by the characters in The Women (1939) is perhaps the most famous from this era, and it’s basically an over-the-top advertisement for MGM’s designer, Adrian. 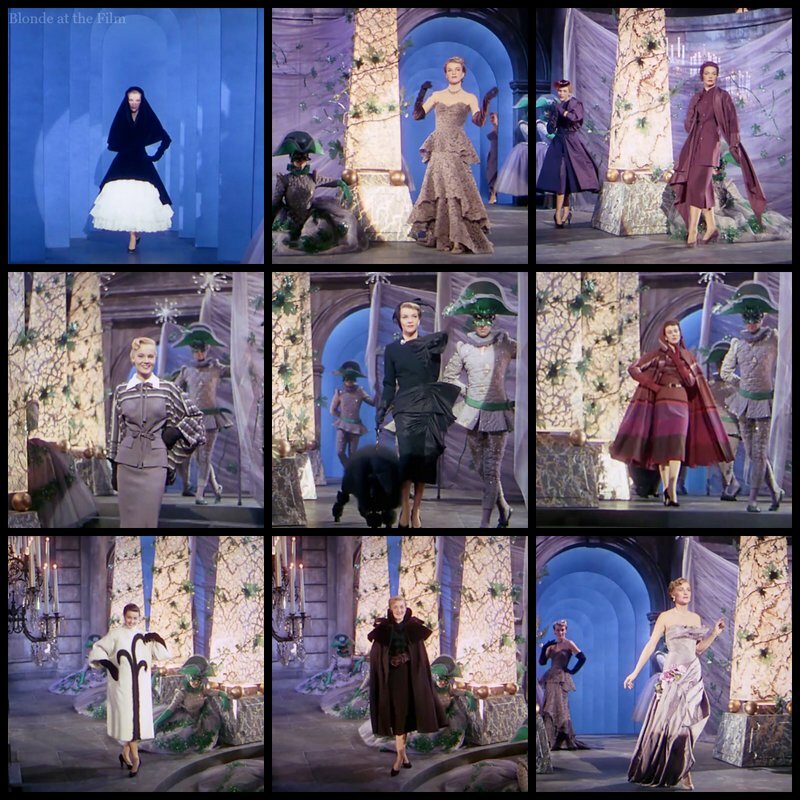 The movie is black and white, but the fashion show is filmed in glorious Technicolor! In a fun twist, before she was a movie star, Esther Williams worked as a stock girl at I. Magnin in Los Angeles. She remembered occasionally modeling the clothes for VIP customers instead of just fetching the garments! 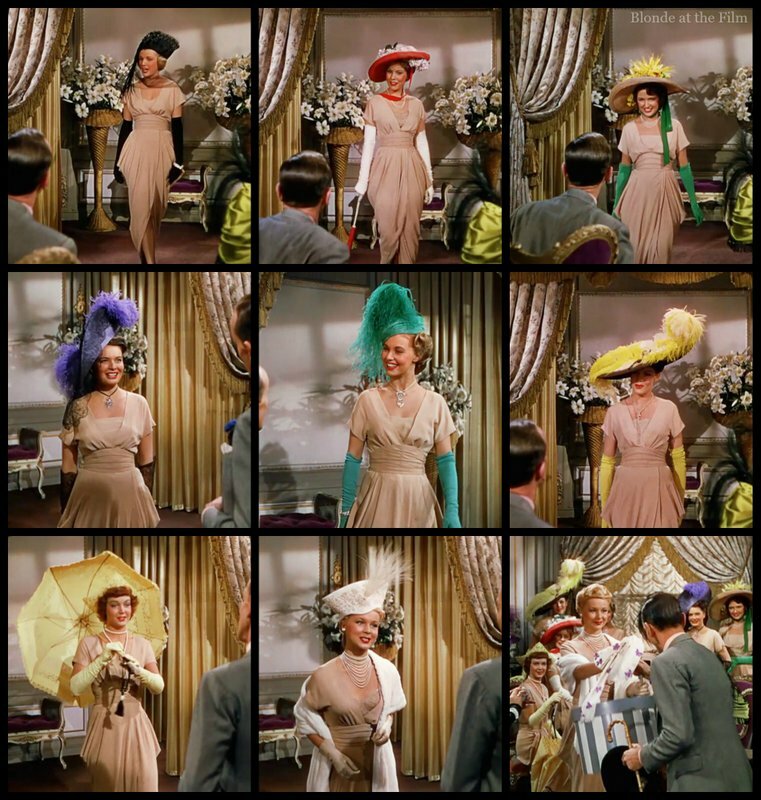 You can see a connection between the themed and highly theatrical fashion shows that existed in reality, and the musical numbers and fashion interludes in films such as Easter Parade, Singin’ in the Rain, Roberta, and Lovely to Look At, among others. Hollywood was doing what it did best: incorporating elements of the real world but increasing the glamour and magic for the movies! You can read more about the history of fashion shows here and in this Slate article. 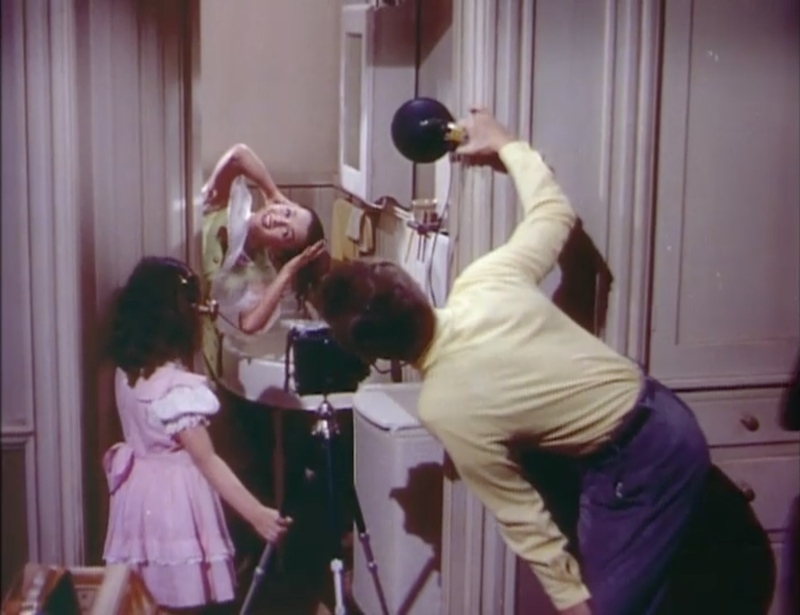 Watch an old movie and at some point you’ll probably see an elevator operator. That’s because before automatic elevators became the norm in the 1970s, using an elevator wasn’t as simple as pressing a button. Manual elevators were “driven” by a lever or other device that controlled when the elevator moved, stopped, and sometimes how fast it rose or fell. Controlling the speed and location, and stopping at the right floor at the right moment so that the elevator was level with the landing, required skill and practice. So elevator operators spent their days driving passengers up and down in hotels, office buildings, department stores, and any other building with a manual elevator. Elevator operators did more than just drive, though. They usually announced floors, acted as tour guides for their buildings, and mentioned various sales or events if stationed at department stores. Marshall Field’s department store in Chicago even required its elevator attendants to attend “charm school” to ensure the proper level of friendly service! Operators were such a common fixture that even when elevators became easier to operate, the attendants often remained to provide that personal touch and service. Surprisingly, elevator operators remained common long after automatic elevators hit the scene. “Driverless elevators” have existed since 1900, but were fairly rare compared to the manual models. According to NPR, driverless elevators made people very nervous. In fact, NPR compared the reaction to automatic lifts to our current anxiety about self-driving cars! That fear was one reason automatic elevators didn’t become the norm until the second half of the 20th century. That’s all for now! 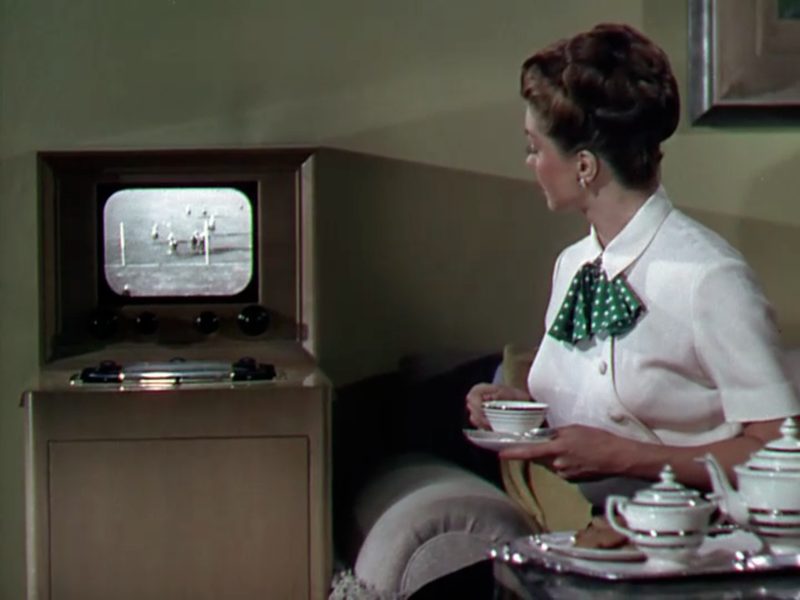 You can find the other History Through Hollywood posts here, including essays on Fashion, Telephones, Vice, Accents, Love, Advertisements, Telegrams, and even Esther Williams and the Olympics. 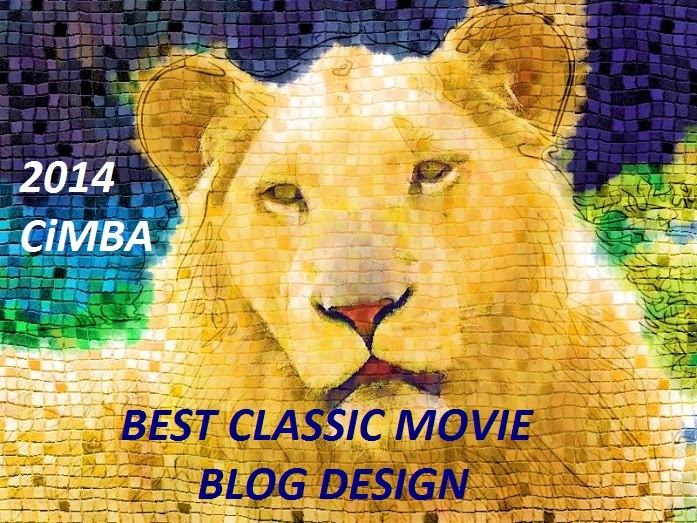 For more on classic movies, follow me on Twitter, tumblr, Instagram, pinterest, and Facebook! As always, thanks for reading! Growing up in the 80s, one of my best friends in New York lived in a building with an elevator operator. We always wanted him to open the gate before he stopped moving so we could jump off. Sometimes (when no grown ups were around) he would. I believe there was still an evening or afternoon edition of one of the San Francisco papers around 1990. I wonder if there will be any newspapers printed at all in twenty years. It’s true that the internet has replaced the multi-edition newspaper. However I am sure with every new progressive technology something is obsoleted. Just as sound and television changed the film industry the internet changed journalism and newspaper publishing. However the content has not changed all that much. News is still news. In the 30’s and 40’s newspapers were the internet of their day.